Is Your Safety Strategy Ready for What's Coming? The marketplace and allocation of internal resources are both increasingly competitive. Safety strategies of the future must align with evolving business goals. Will your company's safety efforts keep up with the demands of the future? Emerging trends are becoming increasing visible regarding how safety is viewed, thought of, strategically managed, and how progress is measured. Moreover, the cast of characters, the roles they play, and accountability for responsibilities are evolving, all for the better. 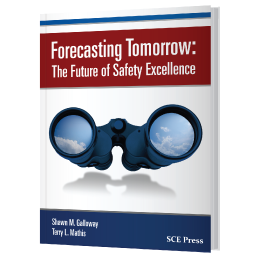 These seven predictions found within this book are based on the authors' years of deep experience as trusted safety advisors across all industry sectors. Follow their actionable recommendations to test strategies, then anticipate and adopt superior practices. Tap this vital industry intelligence to create a powerful, sustainable safety culture for your business and turn it into a competitive advantage. From the authors of the best-selling book, STEPS to Safety Culture Excellence!